It is a wonderful time right now to be a fan of crochet- and knitwear design. There are so many amazing designers producing beautiful patterns and the only downside is that it can be hard to keep up with your favorites. 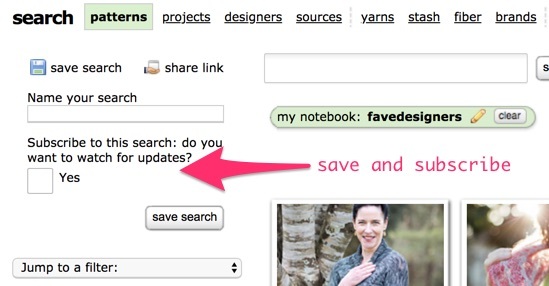 Today’s tip will cover how to subscribe to a search and be notified every time one of your favorite designers publishes a new pattern. First, visit a designer’s page and use the add to favorites button to add them to your favorites. Next, visit the favorites section of your notebook. From there you’ll filter down to your favorite designers and use the advanced search link to go to a search for just their patterns. Finally, you create a new saved search and make sure to select the subscribe checkbox. And that’s it! From then on you’ll receive notifications of new results in that saved search – there will be a little blue dot next to the magnifying glass in the dropdown whenever there is a new result for any saved search. You can click on the magnifying glass to see a listing of all your saved searches and how many new results each one has.